Johannesburg (South Africa) is a vibrant metropolitan city alive with a plethora of cultures making it the perfect landscape for art and design in Africa. 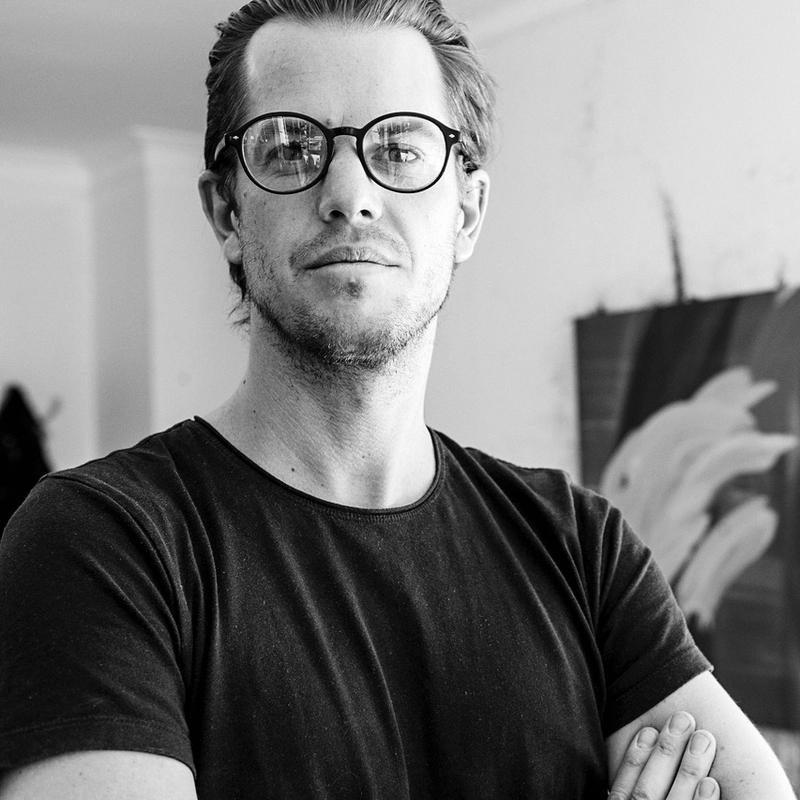 SOL sat down with Hazard Gallery, a contemporary art gallery in the über-cool Maboneng precinct, Co-Founder and Artist Jonathan Freemantle. A natural cool cat with a penchant for black and a sharp aesthetic taste, the temptation to feature him was too hard not to resist. 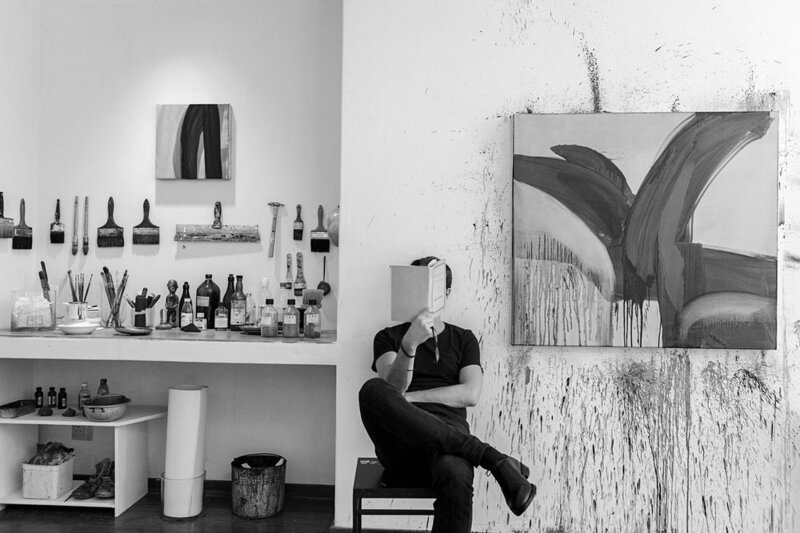 You can creep on more of his Work and Arty Life on his Instagram and his website. Did you always know you would end up in the Art World? Yes. I always knew I would be an artist. I remember sneaking into my Dad’s studio as a kid, it felt like a wonderland to me. Drawing, and then painting became a language for me that felt closer to the instinctive connection I felt with my body, with nature, with the sublime. It felt like my language. It still does. As an Artist and Gallery Owner What does Aesthetics mean to you? Aesthetics is the collection of decisions one makes that define one’s sense of style and of taste. We each have our own individual aesthetic sensibility, some have a more finely tuned sense of aesthetics. The Japanese have a word, Shibumi, which describes their highest expression of aesthetic beauty, an “enriched, subdued appearance or experience of intrinsically fine quality with economy of form, line, and effort, producing a timeless tranquility”. I like this, with a little added mischief. To me the balance of chaos and order in all its forms gives the most thrilling aesthetic joys. There’s no formula really, it’s more felt than seen. How important is aesthetics in your own creative process? Vital. It’s the sexiest thrill to achieve a mark that is simple, alive, charged, complete, electric, balanced, juicy.. Sometimes this thrill can happen just by seeing something fleeting. That glimpse then becomes the rabbit that I chase down the hole. I wear a kind of uniform. I tend to wear black, almost entirely. Sometimes blue. Lately I’ve felt more playful with it all. I’m taking myself way less seriously these days. Where do you go to seek inspiration on a daily basis? Everywhere. But mostly inspiration comes from being ready for it. So I don’t really seek inspiration, rather I work on myself so that I’m ready for inspiration. So that I’m awake. I use various tools for this. Meditation, exercise, music, being inwardly joyful, getting drunk. It seems to get simpler as I get older. Mostly it’s just a matter of stopping for a moment, just being alive. 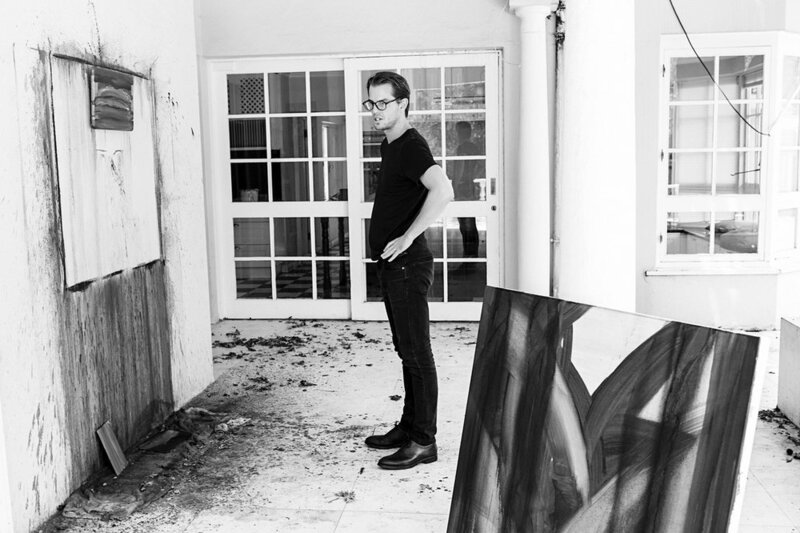 What do you look for when scouting and curating an art exhibition? Something I haven’t seen before or something the artist isn’t seeing themselves yet, and that I can help bring out. Where can one creep on your art? You are co-founder of Hazard Gallery, from your personal and professional experiences how do you envision the future of Art and more specifically the role of the Artist? Big question. I think the role of artist and the future of art are the same as they ever were. Artists are storytellers. We are faced with the great humane / inhumane void before us and behind us and we yearn for some sense of meaning, or relief, or belonging, or forgiveness, or for a place where our desires find an expression. Art does this. Tilda Swinton put it beautifully recently, she calls us ‘Storytelling Apes rather than wise Apes’. I tend to agree. But I also think we can be wise apes too. Any interesting emerging artists/creative on your radar you would like to mention? I’ve been particularly taken by the work of two painters, both of whom I’ve had the luxury of showing at HAZARD – Pebofatso Mokoena and Gresham Tapiwa Nyaude. Finally if you could sum yourself up in a single art piece what would it be and why? I would like to be a Kazuo Shiraga Painting – he was a member of the Japanese Apstract expressionist ‘Gutai’ movement. His works have Zen like poise and wild energy, crashing together. Any of his paintings will do. That or a Giorgio Morandi Still life. I wouldn’t complain if I was a Howard Hodgkin painting either, especially if it was ‘The Sky’s the Limit’ (2002). Truthfully though the real aim of every painting I make is to sum myself up, or to unlock some ecstatic and boundless feeling of myself. I get close every now and then. Most recently a painting titled ‘There is Nothing in the Desert and No Man Needs Nothing (2018) came VERY close.